Communities with foresight have demonstrated that they are the key drivers of the transition towards renewable energy. This initiative is committed to shift energy value chains from centralized utilities to community-owned enterprises and to promote the transition to New Energy by delivering real benefits to the communities. The partners to the initiative are each backed by ambitious climate action plans. Old Energy and its infrastructure still have a firm grip on national and regional economies and there are numerous obstacles in the way of building a civic regime for energy economies. 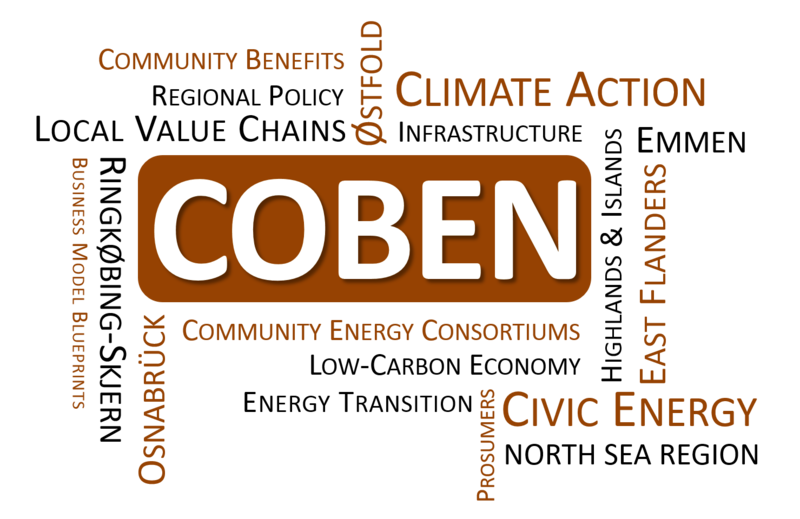 The COBEN project (Delivering Community Benefits of Civic Energy) aims to pilot the needed regional business models in six European North Sea regions and provide transferrable blueprints for later adopters. The pilot schemes address a wide range of civic stakeholders and the collaborative enterprise is supported by a transnational cooperation network and a common process management approach. We are keen to share our achievements with communities and regional developers with similar civic energy objectives. The project is supported by the Interreg North Sea Region Programme.